Minecraft gets the museum treatment, Christopher Kurtz breaks down an antique chair, and more cultural intel to help you make the most of your weekend plans. At his largest gallery show to date, the Los Angeles sculptor displays his recent work in two site-specific configurations. 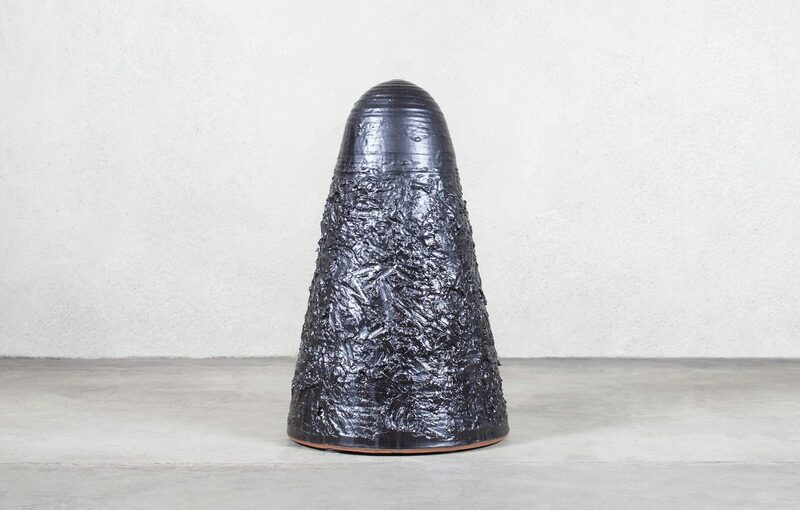 Individually, these black-and-white ceramic pots, which have been fired multiple times to achieve textured surfaces, are things of depth and complexity; when arranged together, they assert a physical presence that dynamically occupies and holds the space. This expansive solo exhibition of Brazilian artist Lygia Pape features works that span her multidisciplinary oeuvre, from her work in the Concrete and Neo-Concrete movements to her video installations and collages. Highlights from the exhibition include the earliest of her Ttéia series, “Ttéia 1A” (1978/1979/1991)—an installation of lighted silver threads that cast intricate shadows on the gallery wall—and “Roda dos Prazeres (Wheel of Pleasures)” (1967)—a circular composition of vessels filled with brightly colored liquids that, on September 15, adventurous participants can taste. In this showcase of the institute’s latest acquisitions, works by contemporary artists such as Cauleen Smith, Sanford Biggers, Giovanni Corvaja, and David Harper are framed alongside the MAD’s current collection, presenting a history of the museum’s collecting mission and its vision of the future of craft. Since 2016, the contemporary artist has been developing her fictional series, chronicling the fates of two Nigerian aristocratic families through highly detailed and opulent portraits. Following the first two installments, “A Matter of Fact” (2016) and “To Wander Determined” (2017), this final chapter presents a new clutch of multimedia canvases bearing Odutola’s intricate mark-making and nuanced view of space, color, and class. This collection of monumental sculptures marks the first solo exhibition of New York artist and designer Christopher Kurtz. Influenced by the historic Birdcage Windsor chair, which dates back to the eighteenth-century, Kurtz reconfigures the piece’s formal language and decorative woodwork by amplifying and magnifying its constituent parts into larger-than-life sculptures. For its second iteration, the Biennale has invited designers and innovators from 40 countries—from Argentina to Taiwan—to interpret the theme “Emotional States.” These commissioned works, including installations, artworks, and proposed design solutions, occupy the entirety of London’s Somerset House, offering perspectives on the relationship between design, emotions, and social needs. In this pioneering exhibition on the creative practice of video game design since the 2000s, character design sketches and prototypes explore the processes that go into developing games such as Journey and The Last of Us, while immersive installations of Minecraft and League of Legends survey the social and cultural impact of collaborative, role-playing games. For its milestone 10th edition, the contemporary art event leads with the theme, “We don’t need another hero,” for which participating artists and contributors are invited to join a conversation about how this moment of geopolitical upheaval has engendered new configurations of knowledge and power. The interiors trade show’s fall edition unveils a refreshed, streamlined structure. At the new Maison hub, the latest interior designs and innovations are shown in four distinct style sectors (Unique & Eclectic, Today, Forever, and Craft), while the Objets hub offers accessories, ornaments, and decorative objects in seven families ranging from fashion to kitchenware. The largest design-related event in the Pacific Northwest marks its eighth iteration with the theme “Trust.” Presented across the city, these projects by designers and community members shed light on how conscious and responsible design can better the quality of lives.